Olmesartan-associated enteropathy is a rare cause of severe enteropathy that should be considered in the differential diagnosis of patients with unexplained chronic diarrhoea. It may be difficult to recognise because of its clinical and histologic similarities to other clinical entities. The authors present the case of a 72-year-old woman with a 6-month clinical history of non-bloody diarrhoea and weight loss. Discontinuation of olmesartan resulted in clinical and histologic recovery, and therefore, physicians need to be aware of olmesartan-associated enteropathy in order to avoid unnecessary testing. Although rare, it is considered an emerging and underdiagnosed enteropathy. Marthey L, Cadiot G, Seksik P, Pouderoux P, Lacroute J, Skinazi F, et al. Olmesartan-associated enteropathy: results of a national survey. Aliment Pharmacol Ther 2014;40:1103–1109. Rubio-Tapia A, Herman ML, Ludvigsson JF, Kelly DJ, Mangan TF, Wu T, et al. 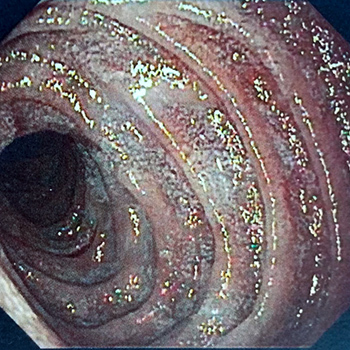 Severe sprue-like enteropathy associated with olmesartan. Mayo Clin Proc 2012;87:732–738. Burbure N, Lebwohl B, Arguelles-Grande C, Green PHR, Bhagat G, Lagana S. Olmesartan-associated sprue-like enteropathy: a systematic review with emphasis on histopathology. Hum Pathol 2016;50:127–134. Hujoel IA, Rubio-Tapia A. Sprue-like enteropathy associated with olmesartan: a new kid on the enteropathy block. GE Port J Gastroenterol 2016;23:61–65. Rached AA, Hajj WE. Eosinophilic gastroenteritis: Approach to diagnosis and management. World J Gastrointest Pharmacol Ther 2016;7:513–523.